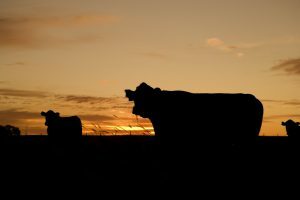 A couple of recently-released reports provide some interesting observations about the state of the beef industry and some good news for the long run as well. 1. Over the past decade, the quantity of beef consumers purchase has become less sensitive tochanges in beef prices yet more sensitive to consumer incomes. This could be a result of record high retail beef prices in recent years that resulted in loyal beef consumers, who are less price sensitive, having the strongest presence in the market. As consumer incomes have grown, more consumers who might have been priced out of the beef market, have allocated some of that income growth to purchase beef again thus increasing beef demand response to growing income. 2. 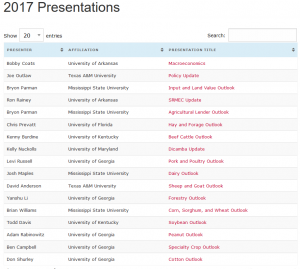 The relative impact of pork and chicken prices on beef demand is economically small relative to other factors. This does not imply individual beef, pork, and chicken products are not substitutes, rather the substitutability in aggregate is just not as strong as traditionally thought. 3. Print media and medical journal coverage of topics around beef changes notably over time in areas of focus and volume of coverage. Certain types of media coverage are found to affect meat demand, and an emerging area of negative impact focuses on climate change. Having an impactful presence in the media is immensely important as it shapes perceptions. 4. Some demographic trends are favorable for beef demand including anticipated growth of Hispanic and African-American populations within the U.S.
On January 31, the 2018 cattle inventory report was published by the USDA. This report compares inventory levels on January 1, 2018 to those of January 1, 2017. This report is a great opportunity to see what is happening on the national scale for cow-calf producers and in the feedlots. This year’s report tells a familiar story: slow herd expansion. Nationwide, the herd has been expanding since hitting a bottom in 2014. The previous several years saw a decline due in part to serious drought in the western U.S. Expansion in the herd overall was only 1%, significantly slower than the previous few years. This was expected, as we’ve seen slaughter rates for beef heifers and cows pick up significantly in the last couple of years. This year’s report showed a 4% reduction in the number of heifers currently held as beef cow replacements, indicating that during 2018 we will likely see very little to almost no growth in the herd. Finally, the calf crop increased 2% relative to last year and the number of cattle on feed increased 7%. This pre-report commentary provides additional context to the report. As we continued to see slower herd growth and some bright spots for beef demand, I’m cautiously optimistic that we will be able to maintain profitable calf prices and stocker margins through 2018. If you have questions, please don’t hesitate to contact me at lrussell@uga.edu. 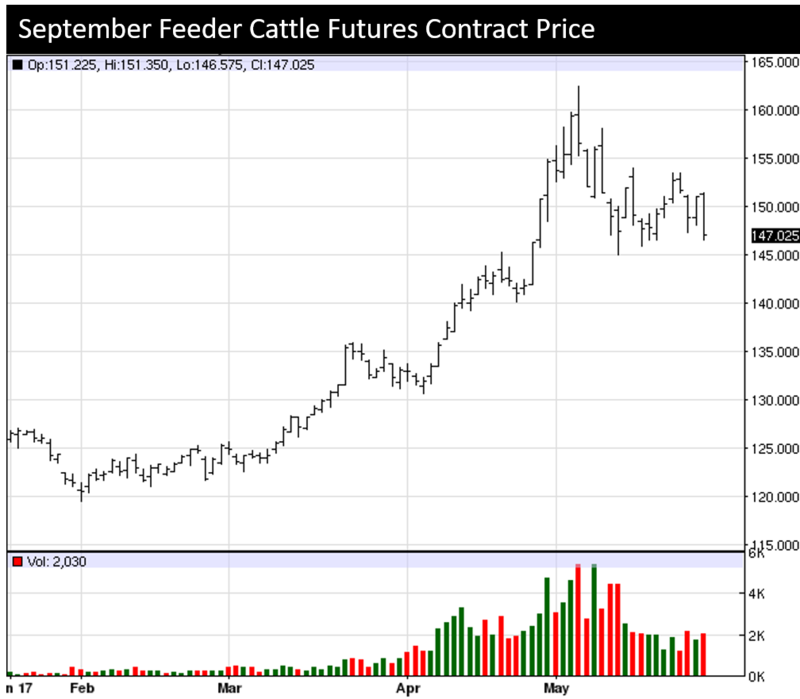 The recent run-up in wholesale beef prices has sent cash and futures prices through the roof in the past few weeks. This provides an opportunity for producers with spring-calving herds to lock in a profit. For instance, right now producers can buy a put option on the September feeder contract at a strike price of $135/CWT for $1,375. This is relatively cheap “insurance” since we’re likely to see calf prices fall again in the near future as wholesale beef drops back down or feedlot margins are squeezed. Today’s cattle on feed report is a good example of bad news at the feedlot level affecting marketing prospects. 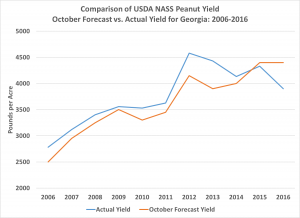 So far today we’ve seen a significant drop in feeder futures due to the slow pace of marketing relative to placements in April. Now is a good time to lock in profit as we’ll probably continue to see some downward pressure on feeder prices in coming months. For more information on hedging and options, check out the following publications.